Wash off brake fluid immediately if it comes in contact with any painted surface. Remove the union bolt and gasket(s). 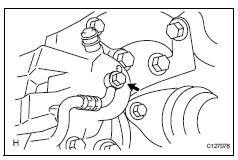 Disconnect the flexible hose from the brake cylinder. Remove the 2 bolts and cylinder. Remove the 2 disc brake pads. Remove the shims from each pad. Remove the indicator plates from each pad. Remove the 2 plates from the brake cylinder mounting. Remove the 2 bolts and cylinder mounting. Remove the 2 pins (upper and lower) from the mounting. Remove the 2 boots from the mounting. Using a screwdriver, pry out the set ring and boot. Be careful not to damage the brake piston and cylinder. 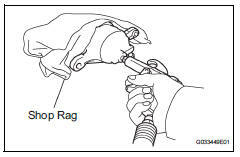 Place a shop rag or piece of cloth between the piston and disc brake cylinder. 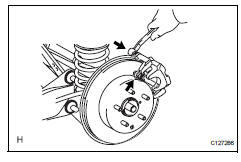 Apply compressed air to remove the piston from the disc brake cylinder. Do not place your fingers in front of the piston when applying compressed air. Be careful not to spatter the brake fluid. Using a screwdriver, pry out the seal from the cylinder. Be careful not to damage the inner cylinder and piston seal groove. 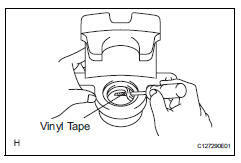 Remove the bleeder plug cap and bleeder plug from the cylinder. 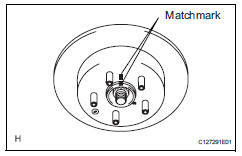 Install the shoe adjusting hole plug from the rear disc. Check the cylinder bore and piston for rust or scoring. If necessary, replace the cylinder and piston. 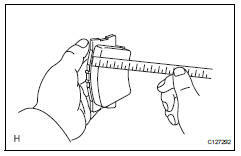 Using a ruler, measure the pad lining thickness. If the pad lining thickness is equal to or less than the minimum, replace the pad. Check the 2 plates as follows. If necessary, replace the plates. Use brake cleaner to clean the pad support plate's pad and cylinder mounting contact surface. Inspect for deformation, cracks, rust and foreign matter that is difficult to remove. 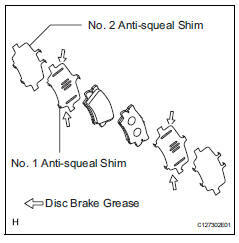 Use brake cleaner to clean the cylinder mounting's pad support plate contact surface. After installing the pad support plate to the cylinder mounting, inspect for looseness and deformation. After installing the pad, inspect if the pad falls off easily (due to the spring force of the pad support plate). Using a micrometer, measure the disc thickness. If the disc thickness is less than the minimum, replace the disc. 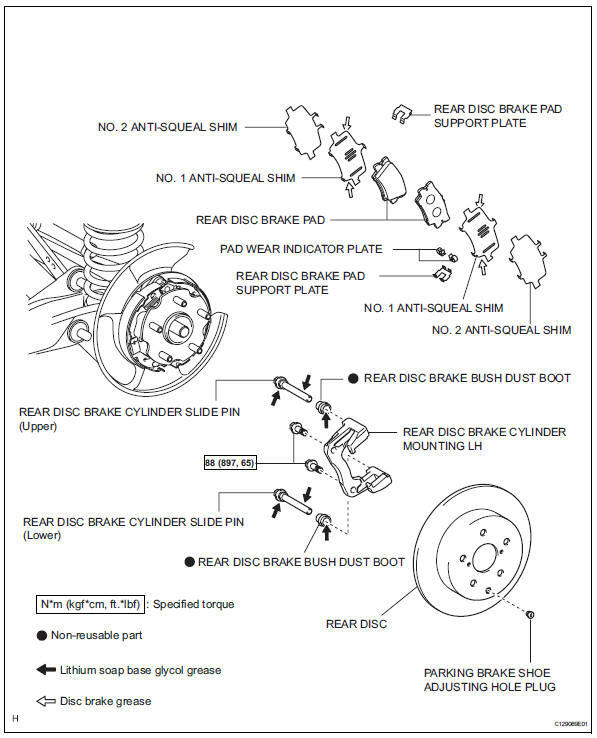 Check the bearing backlash and axle hub deviation (see page ah-16). Tighten the disc with the 3 hub nuts. 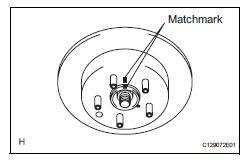 Using a dial indicator, measure the disc runout 10 mm (0.39 In.) From the outer edge of the disc. 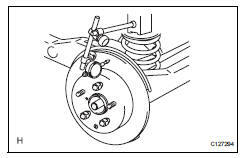 If the runout is greater than the maximum, change the installation positions of the disc and axle so that the runout will become minimal. If the runout is greater than the maximum even when the installation positions are changed, grind the disc. Remove the 3 hub nuts. Install the adjusting hole plug to the rear disc. Install the bleeder plug to the brake cylinder. 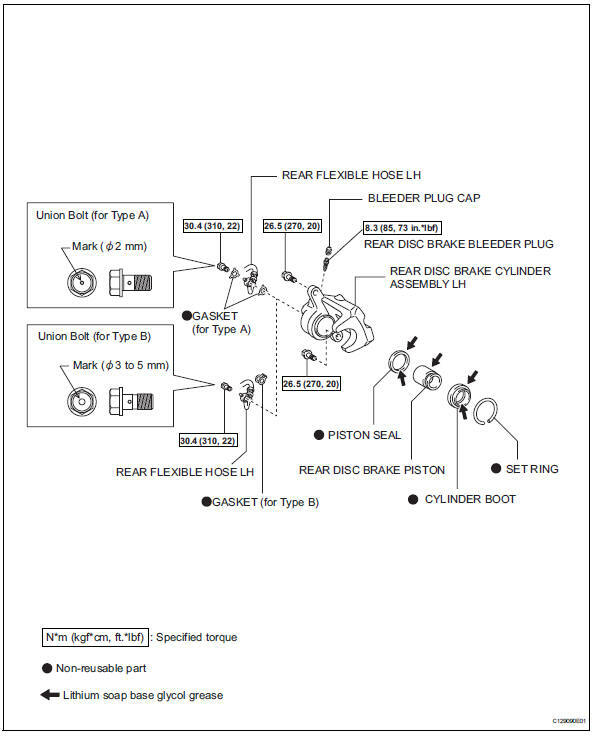 The bleeder plug will be tightened to a torque specification in the "bleed air from brake line" procedures. Install the bleeder plug cap to the bleeder plug. 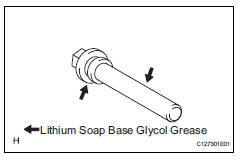 Apply lithium soap base glycol grease to a new piston seal. Install the piston seal to the brake cylinder. 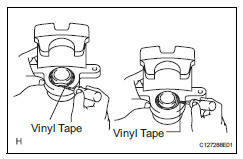 Securely install the piston seal into the groove of the disc brake cylinder. 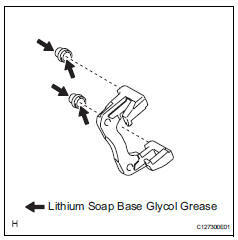 Apply lithium soap base glycol grease to the brake piston and a new cylinder boot. Install the cylinder boot to the brake piston. 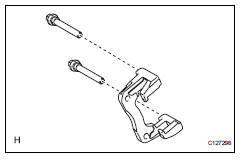 Install the brake piston (with the cylinder boot) to the brake cylinder. 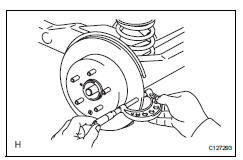 Do not forcibly install the brake piston to the brake cylinder. 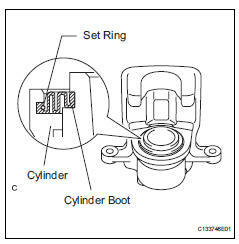 Install the cylinder boot to the cylinder. Install the boot securely into the grooves of the brake cylinder and brake piston. Using a screwdriver, install a new set ring. 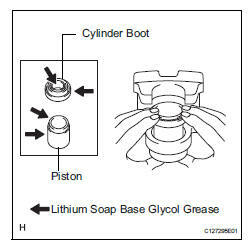 Apply lithium soap base glycol grease to 2 new boots. Install the 2 boots to the mounting. Apply lithium soap base glycol grease to the pins. Install the 2 pins (upper and lower) to the mounting. Install the cylinder mounting with the 2 bolts. Install the 2 plates to the mounting. Install the 2 indicator plates to the lower side of each pad. 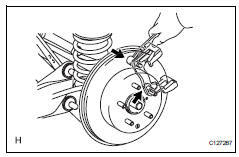 Apply disc brake grease to both sides of each no. 1 Shim. Install the no. 1 And no. 2 Shims to each pad. When replacing a worn pad, the shims must be replaced together with the pads. Install the shims in the correct positions and direction. Install the 2 disc brake pads to the mounting. There should be no oil or grease on the friction surface of the pads and disc.